Imagine that you're a paleontologist, and have just found a set of bones. 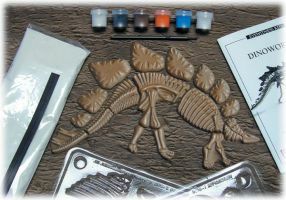 With Dinoworks, you not only get to investigate them, but to cast your own! With the materials and amazing info in this kit, you can be there from the moment the first bone is 'found', to the thrilling finale of the unveiling of the entire skeleton on display. In the end you will have built and painted your own detailed dinosaur skeleton and learned all about paleontology in the illustrated educational booklet included. Display your museum specimen by gluing it to a paper, or attaching the included magnets! Mold and casting compound, paints, glue, and magnets!